"Let's do something this weekend." "Good idea. What do you wanna do ?" "I don't know, but let's do something fun." "Go for a bike ride ?" "We could go back over by Rockford on that bike trail I like - what's it called again ?" 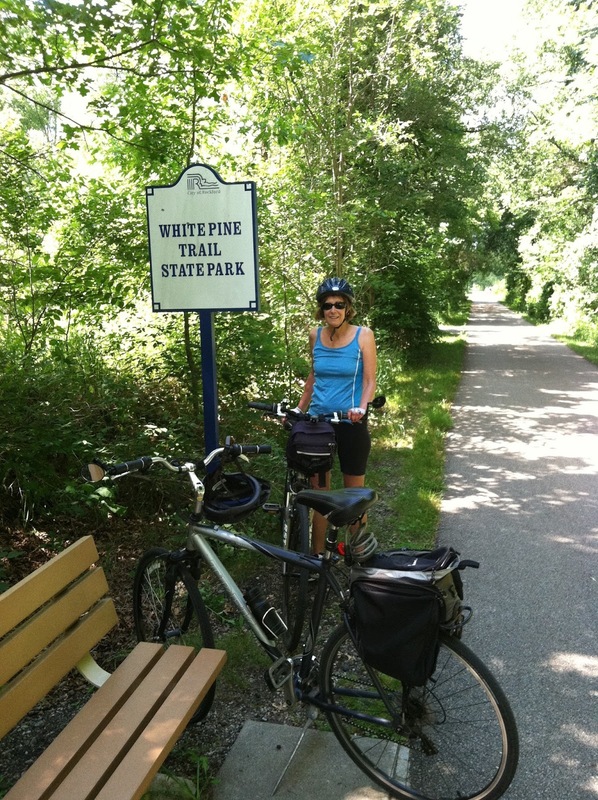 "The White Pine Trail. Fun. Let's do it!" So the old guy put the bike rack on the car, Nannie filled her water bottle, they both changed into their very attractive biking shorts, and the Mzungus headed off to Comstock Park. Arriving at the trail head parking lot, (behind some stores and restaurants downtown), they slathered on the sun block, straddled their metal steeds, and peddled up the converted railroad bed. It was a perfect day with a mix of sun and clouds, a light breeze, and very pleasant temperature for a nice ride. The couple rode about 22 miles, stopped for a couple of refreshing and well deserved local brews and then finished with about 8 more miles back to the car. "Hey Kate - wanna go Kayaking?" "That sounds like fun. Is Nannie coming?" So Kate, Nannie, and the old guy bundled into the car and headed down to Douglas and the kayak livery at Wades Bayou. All the kayaks were rented out so they decided to have a little lunch and come back a little later. A couple of hours later, the kayaks were available and off they went. It was a beautiful cloudy day and not too hot as they meandered around the lily pads and tall reeds.